Medical waste is generally divided into two separate categories- common medical waste, and any type of waste that could cause an infection, often labeled regulated medical waste, infectious waste, or biomedical waste depending on the state you’re located in. 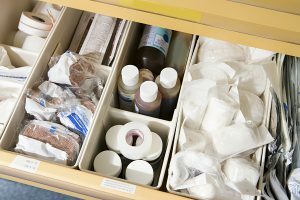 Medical Waste Pros will connect you with a local, reputable medical waste disposal company in your area. We’ll send you free, no obligation, customized quotes in minutes that fit the needs of your company and can take care of your common medical waste and any infectious medical waste disposal as often as you need it. To get started, fill out the form to the right, or give us a call at (888) 755-6370. Medical Waste Pros can collect your general medical waste on a regular basis, especially if you have regulated medical waste that needs to be collected and disposed of properly. Medical Waste Pros can help you find a compliant common medical waste disposal company right in your area. We’ll help you select the containers, schedule, and system that works best for your organization. To get free quotes on common medical waste disposal, fill out the form to the right, or give us a call at (888) 755-6370.